The Realm of Possibility is gorgeous. Absolutely gorgeous. I haven’t read many books in prose (or song lyrics, or stream of consciousness – which all appear in The Realm of Possibility, but for ease, I’ll just say it’s prose), because the few I have read haven’t been able to get me to really invest my emotions. There’s a kind of detachment because not everything flows in the right way. But that was not the case with The Realm of Possibility. This was written so beautifully, and I connected with every single one of the character pieces that I read. Each one was so very unique and distinct, and I could feel everything they were feeling. It was just superb. One of the things I absolutely loved most about The Realm of Possibility was the fact that all the characters were connected. I think you would have to pay close attention to realise the connections between some of the characters, but even so – it was lovely. I was able to read about why characters were the way they were, and why they felt the way they felt. dreamed about saying things i dreamed of hearing." AH, I JUST REALLY REALLY LOVED THIS BOOK. And I just want you to read it. I want you to read it in one sitting, like I did. Because it just lets you invest yourself in the book, and I think it’s a lot easier to see the connections when you’re reading it in one go. So, please. 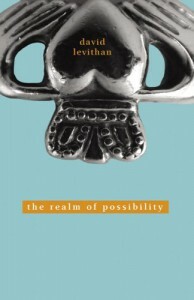 If your morning is like mine right now – rainy and cold and in no way outside weather (or even the opposite – sunny and warm and you can read on the grass) – pick up The Realm of Possibility. Read about love, and friendship, and pain, and happiness, and everything that makes us human. Because you won’t regret it. Because The Realm of Possibility is one of the most beautiful books I have had the pleasure of reading this year. Because after I finished, I held it to my chest and wrapped my arms around it. Because you need it in your life.